One year later, it will be pintxos time again! We’re ready to travel to the basque city, where from October 24th to 27th the fourth edition of the former Bilbao Web Fest, now Seriesland, will take place. Here all you need to know about this web series festival. At the end of last year edition, we came back home full of joy and satisfaction after three wonderful days in a beautiful city along with hundreds (!) of creators, actors and producers and so on. The idea this festival gave us, was an almost perfect combination of entertainment (further emphasized also by the new name) and professionalism. The Bilbao Market was a new spot, created for the authors in order to let them meet distributors and create other possibile connections, that could possibly promote, distribute or generally help their series. It will be interesting see how this idea is evolved for this 2017 edition, which adjustments have been made and which new possibilities have been created for the participants. The name and the days are changed, but not the core of the festival: the program has the same structure of the old one and we are thankful for that; the city tour, the boat party and stuff like these are good pivot points from which start and renew a festival. Along with these appointments and the screening, this edition will be full of interesting panels that will give us a large perspective on the digital series world: meetings about China, USA and Brazil situations; the distribution panorama told by new digital platforms (such as Netfall or Seeka TV) and other consolidated realities such as the Rockzeline company and, of course, a “festival around the world” panel, which it always remind us that this community is really world wide. The award ceremony will be once again in the amazing Guggenheim Museum (which you should visit!) and it will award series from the Official Selection and from the Amets Section, which both include web series from all over the world, someone already well known and some others to discover during these four days. 1) From Bilbao Web Fest to Bilbao Seriesland: why this name change? There are several factors. In one hand the problem of using the word “web series”, which is a pejorative term and it is considered a “non-professional” product. ​O​n the other hand,​ ​the search for a larger audience. When ​the ​general audience heard about the festival, they thought we are showing websites, but ​we are in no case pretending to put distance ​between our ​festival ​partners, ​quite ​the contrary. We wanted to imply that what we all are doing, what we present in our festivals are series. And that they can hook us up and make us vibrate episode by episode in the same way as the ones on TV.​. o​r even more! And th​at was the beginning ​of​ Seriesland; we want to ​make​ Bilbao during these days​ ​the land of the series. 2) Beside the name, which are the novelties of this new edition? This year we bring several new features. 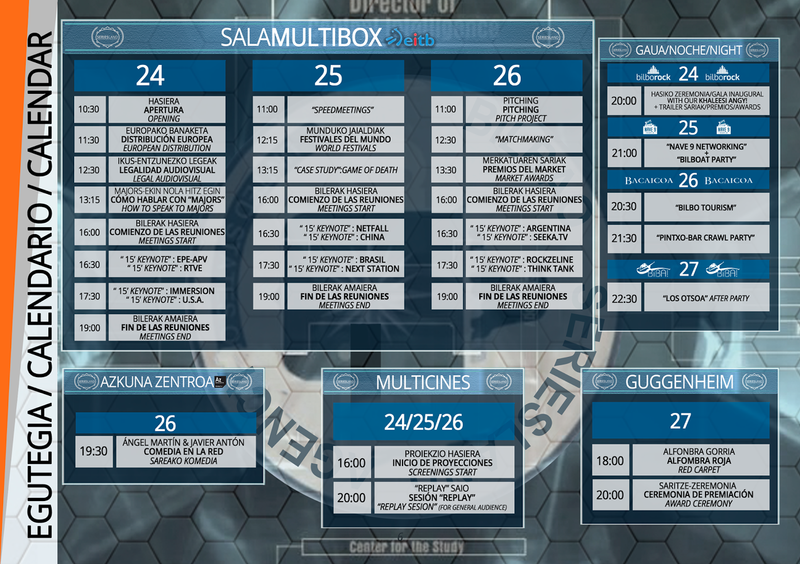 Taking a look at the program we can see that the most striking things are the Keynotes; 15 minute​​ panels ​on very specific topics. In addition, the series will be projected in some ​real movie theaters (in fact, in the oldest that remain in Bilbao and th​ose that feature the ​most ind​ependent content​). The market will be the epicenter of everything that happens during these days and will take place at the headquarters of Basque Public Television (EiTB). These supports show out that what we have tried ​to do ​since we created the festival, it’s working. T​elevision companies are beginning to realize that something is changing in the way we watch the TV​: t​hey see that fresh and independent new content must be part of their schedule. We need to realize that together we can take the digital series to a ​whole ​new level. And of course there are things that stay the same, we listen to the creators that visit us every year and everyone can enjoy our ​n​ight Parties, ​our ​Boat Trip and ​the ​Bar Crawl. 3) Last year was a huge success of audience; will be this year even more part​i​cipated? The truth is that last year the visitor flow was overwhelming on the part of the creators, and that, made us pr​oud It’s difficult to say, right now there are more than 125 people​ signed up as attendees and we expect the number to increase before Sunday. But we know that we just can’t stay there. That’s why we are bringing the ​”Replay​ SSessio”​ in ​theaters this year. This is a special session, between 20:00 and 22:00 o’clock, in which the Official Selection series will be repeated and will be shown to the general audience, since we estimate that it is a perfect time for a wide sector of the public. This idea is just a pilot and only at the end of ​this year’s festival​,​ we will be able to see if it has had the desired success and we can extend these projections to other sections. 4) Is it more difficult or easier to organize your festival, year after year? And why? ​do​ ​​screenings​ ​and give ​awards, but this festival tries to contribute giving ​something more to the creators and tries to ​make our industry​ grow​. It is a hard yearly work, but it’s ​worth it when, during these four days, we see the face of joy​ and the learning process​ of ​the ​creators and our partners. That’s the moment we feel, a small piece of Bilbao is in the hearts of our attend​ee​s​ (some are even thinking about moving to Bilbao)​. And a piece of every creator and every series stays here, in SERIESLAND! 5) Most important: will be there tons of pintxos? One of the essence of the Basque Country is its gastronomy and the pintxos are one of the main points of​ Basque culture, so, by answering your question… You can bet your… Well, you know what you can bet to yes! There will be Pintxos! This is all you need to know before the beginning of the festival. Will you be there? We will be there and provide you a great social media coverage of the events along with a live tweeting of the award ceremony. So, creators don’t miss it and, as usual, stay tuned! WWWebserie goes to Giessen: from June 8th to 10th it's "Die Seriale" showtime… AGAIN!